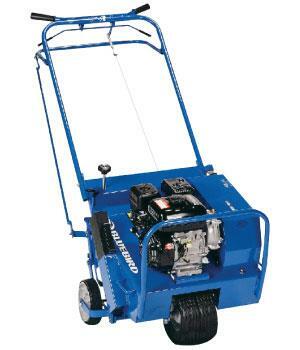 4 hp Honda, Self-Propelled Core Type Aerator. Weighs 265 Lbs. including (2) 36 lb Removable Weights. 17" Aerator Width -- 27" Total Overall Width. Handles will fold to 28" high for easy transport. * Please call us with any questions about our aerator 17 inch bluebird self prop rentals in Oak Grove MO, Blue Springs MO, Independence MO, Lexington MO, Odessa MO, Independence MO and Western Missouri.